Vegas Watch: The Long Con of @RJinVegas: Is This Earth? The first issue with this is the same as with all the "Vegas says" stuff: you have to consider the source. With these random prop markets, whether they're posted by Sportsbook, Bovada, or whomever, we're talking about an often fresh market with minuscule ($50-$100) limits that some sportsbook employee made up and emailed out to a bunch of media folks for PR purposes. Sure, they're real odds that you can bet a few bucks on (if you somehow haven't been banned from the very square books which post them). But, once again, we've lost the purpose of seeing what "Vegas says", as no sharp bettor has, or will be able to, bet any significant amount of money on these odds. 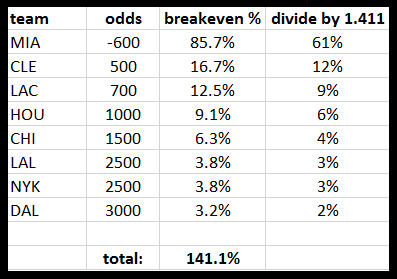 And even in an alternate universe where they could, the vig on just those eight teams adds up to 41.1%, which is almost nine times higher than a standard -110/-110 sides market. This is meaningless. Bell would describe this as applying the juice evenly to get to the "true percentages", but he is the only person in the world who's manipulating these numbers like this. And for good reason. It's not like guy putting these together at Sportsbook.ag sat around and came up with the "true percentages", decided he wanted the vig in this market to be 41.1%, and then multiplied all the "true percentages" by 1.411 in order to figure out what odds he would offer. But Bell is trying to reverse engineer these numbers by gough through the inverse of that absurd process in order to "translate" them into a more "meaningful" format than that, so media folks can quote him as reporting that Vegas says the Heat have a 61% chance of re-signing LeBron. But they're not meaningful at all. All you could say from this market is that it implies the Heat have less than an 85.7% chance of signing LeBron. If all 32 teams were listed, you could also figure out a minimum percentage, based on the "not Miami" position you could synthetically create by betting every team other than the Heat. With the obscene vig, that number would probably be somewhere around 40-45%. But there are only eight teams listed, so all we can really infer is that Vegas says the Heat are between 0% and 86% to re-sign LeBron. If the $100 prop market which just got posted at a book that boots anyone sharp can be trusted. One hundred and seventy-six reteweets, tho. And some of them probably weren't even ironic!